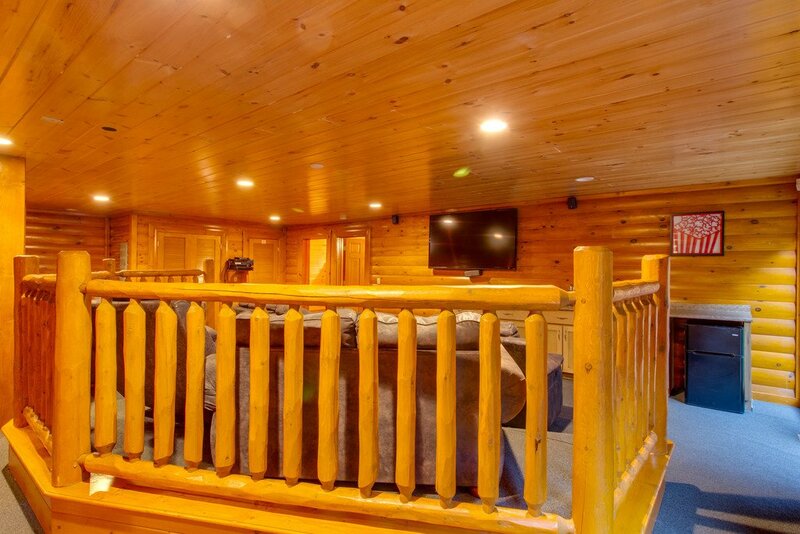 Retreat to your very own Mountain Cinema Lodge. 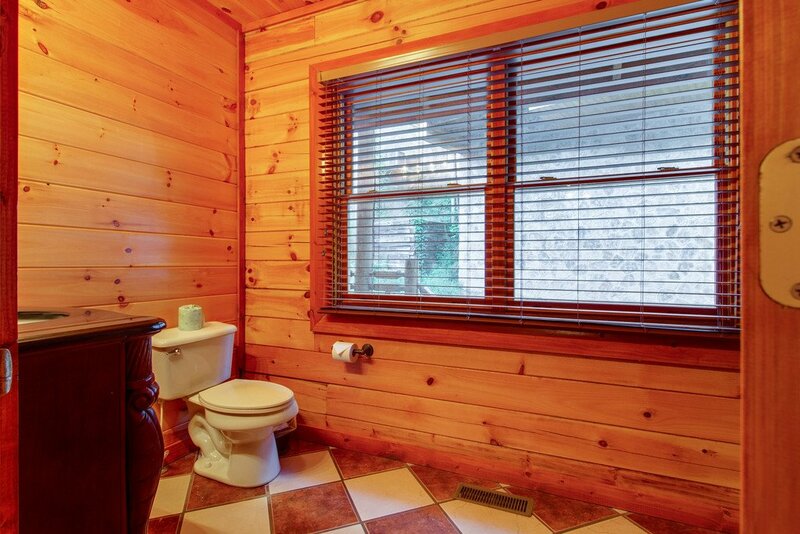 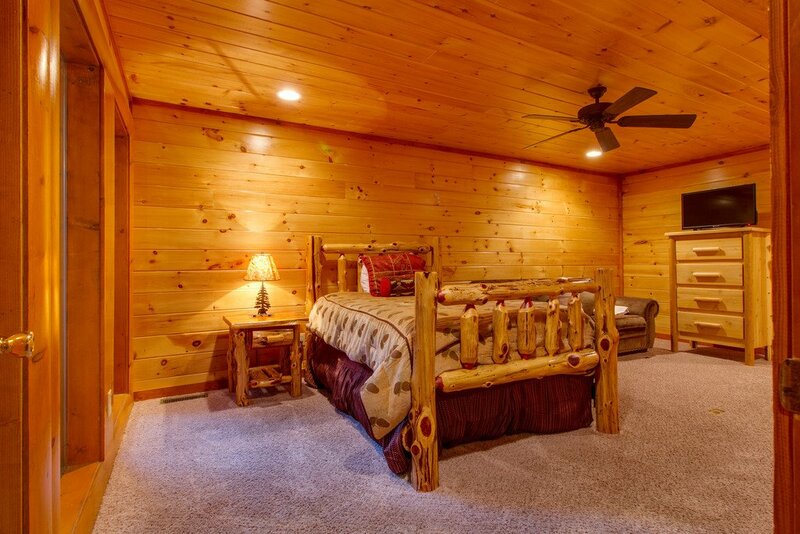 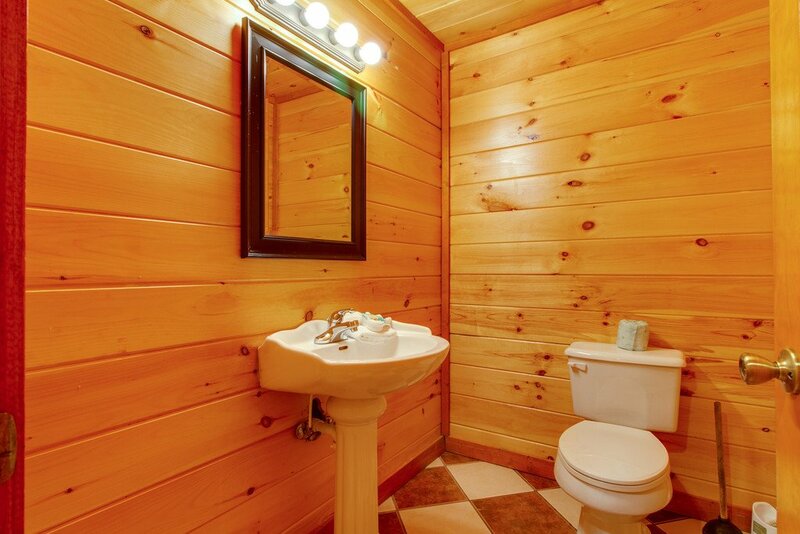 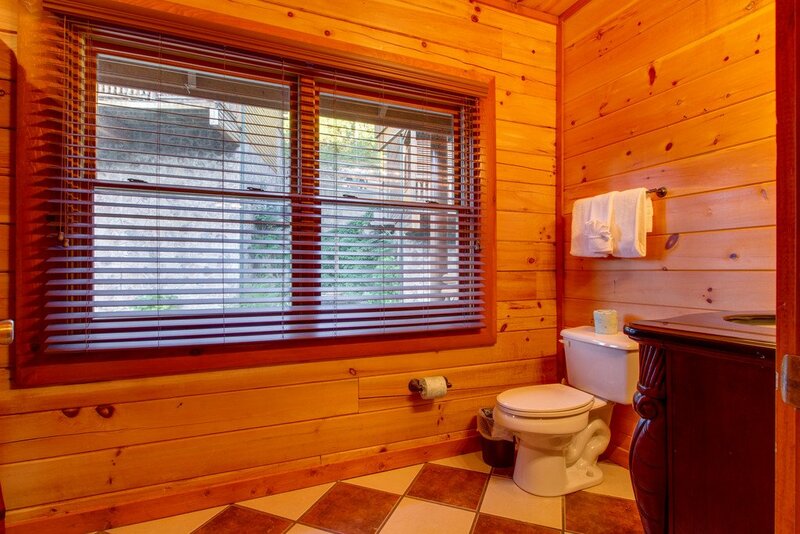 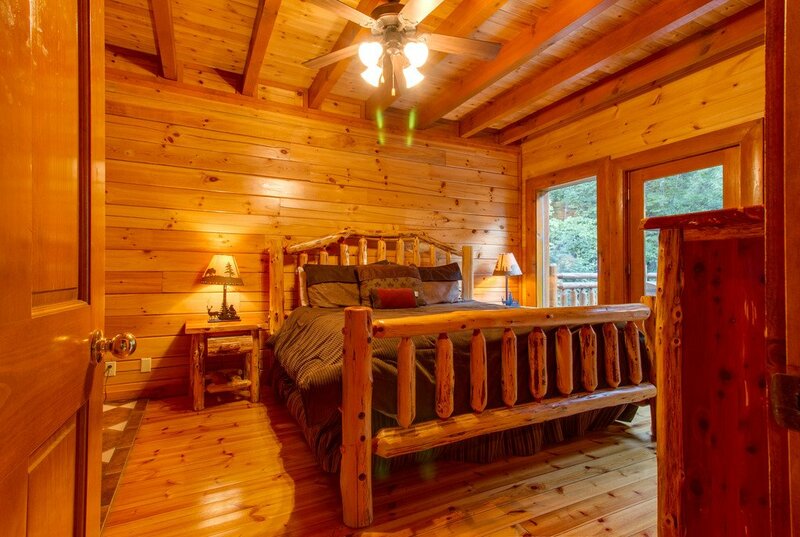 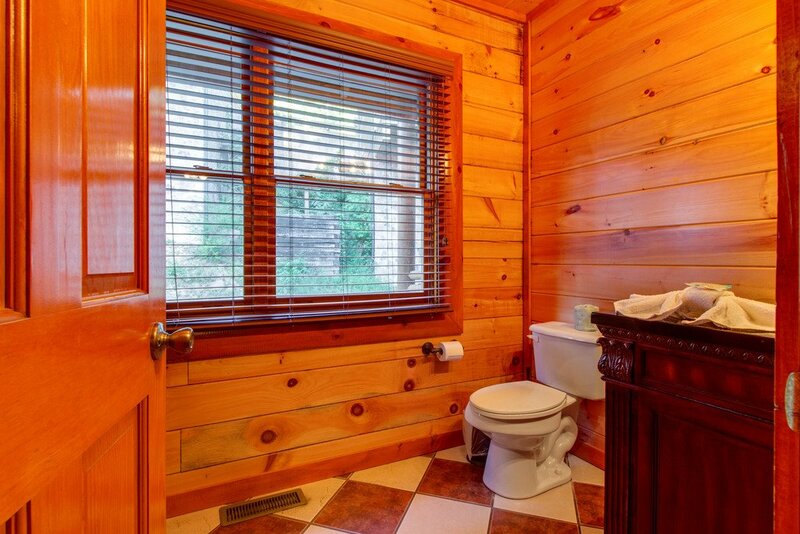 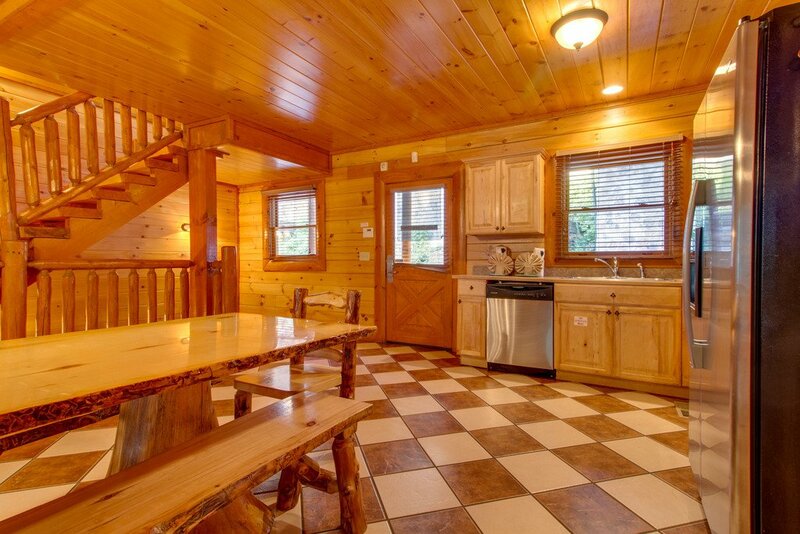 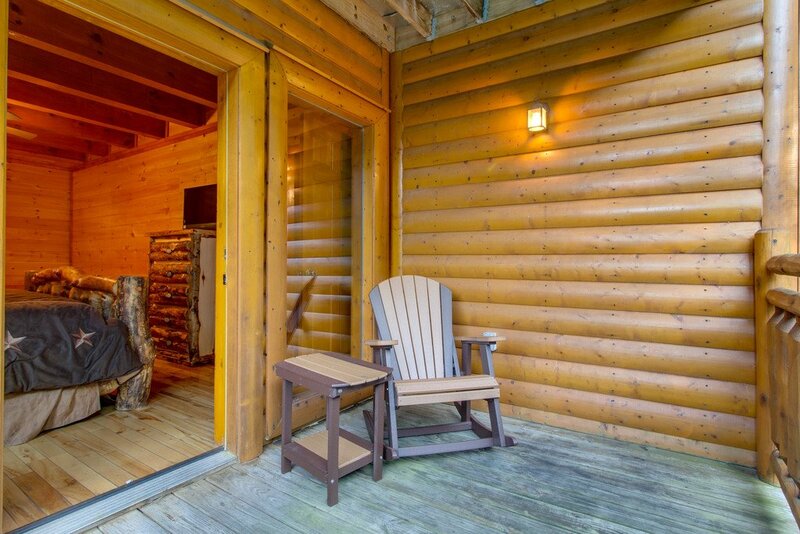 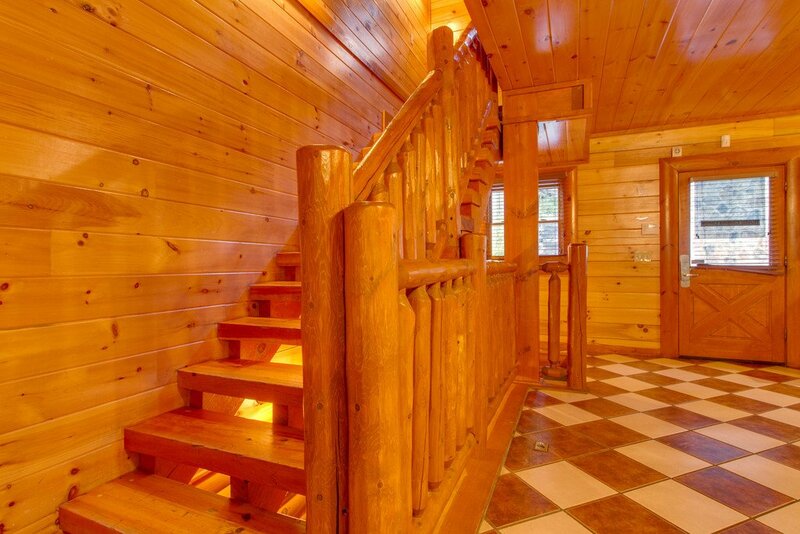 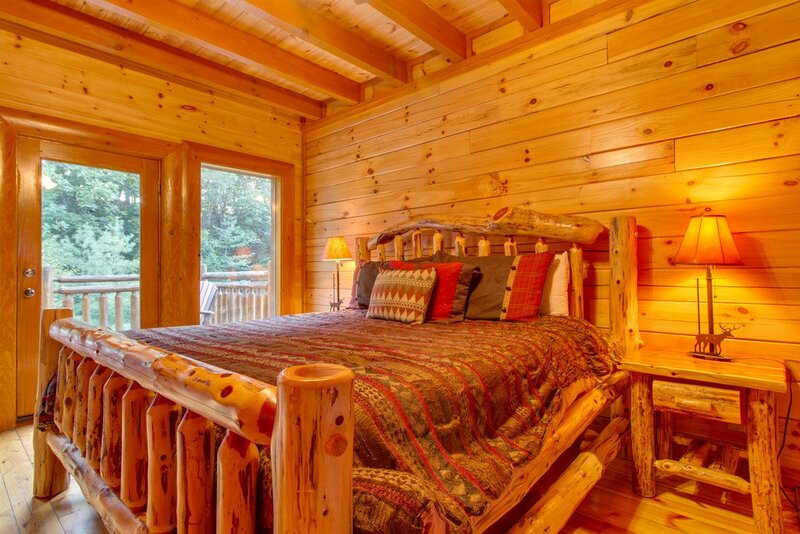 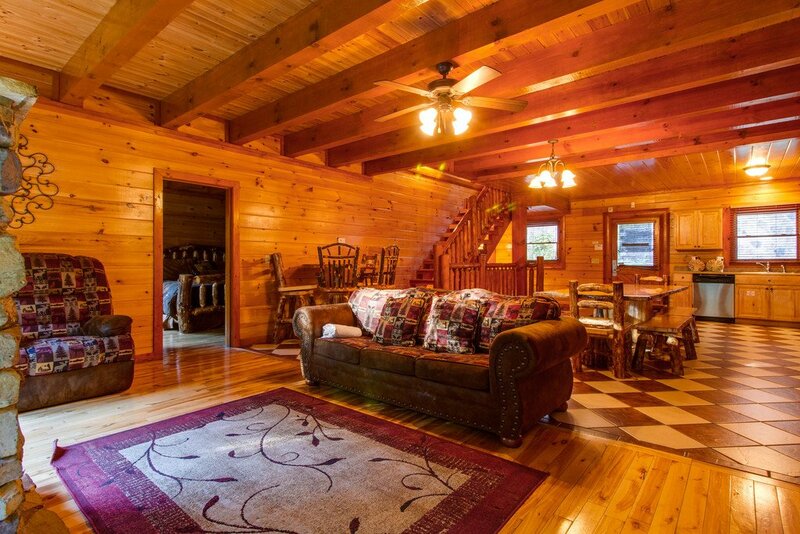 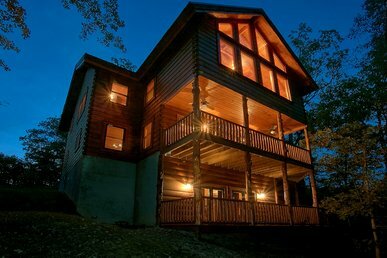 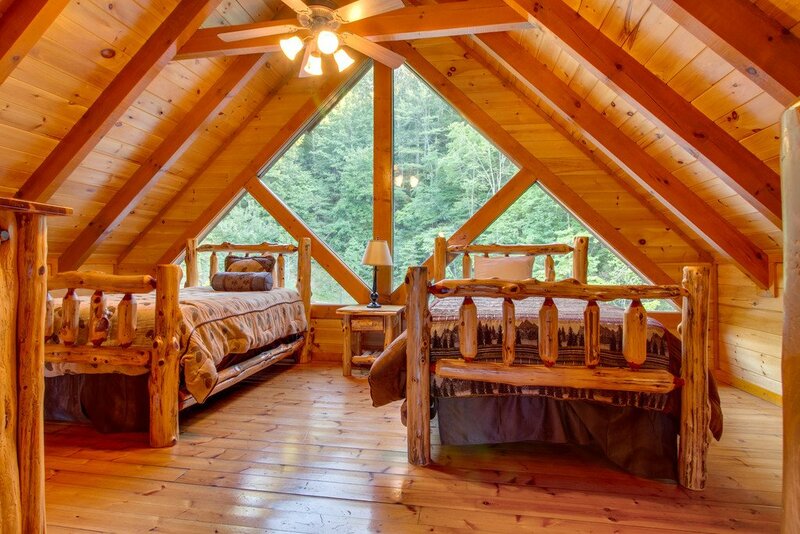 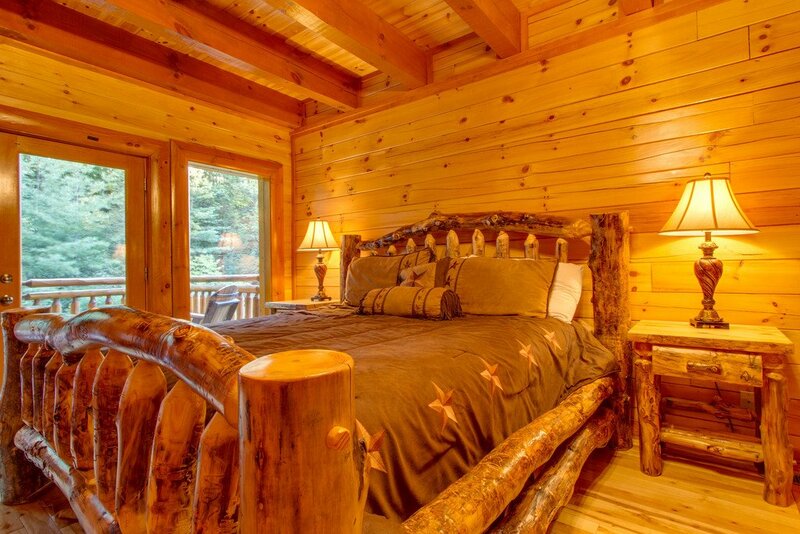 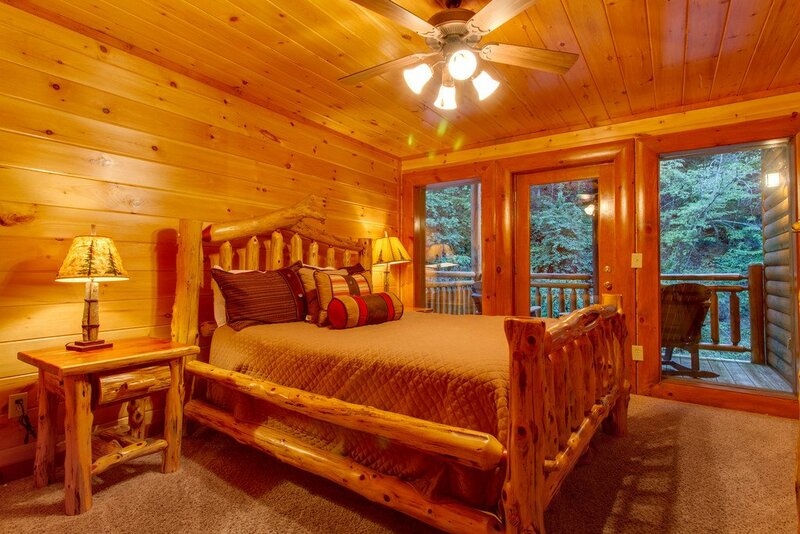 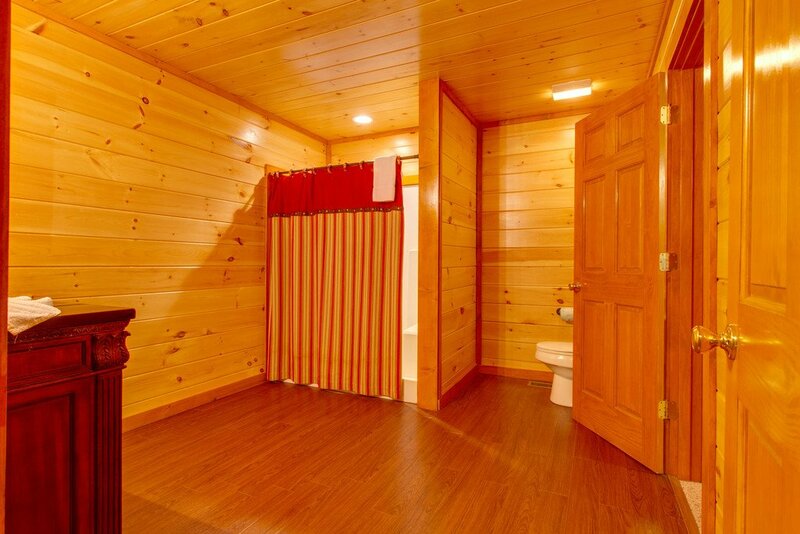 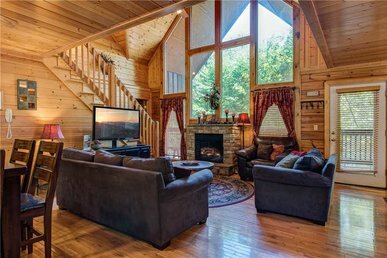 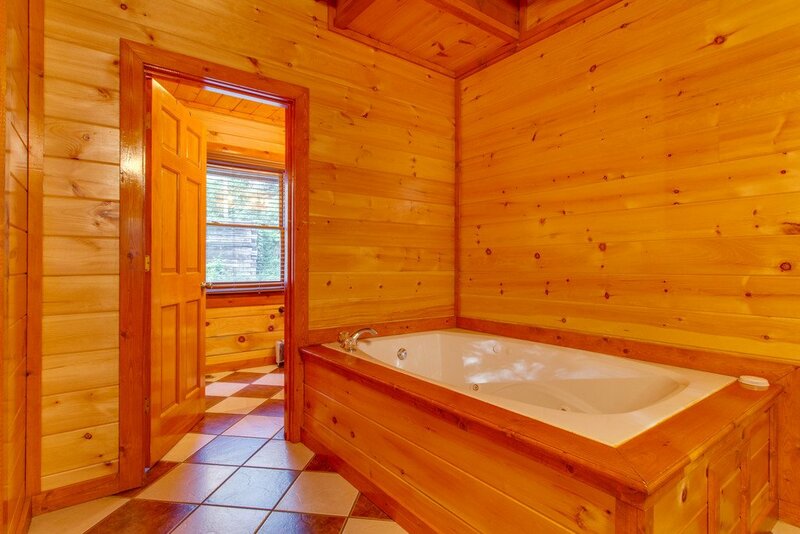 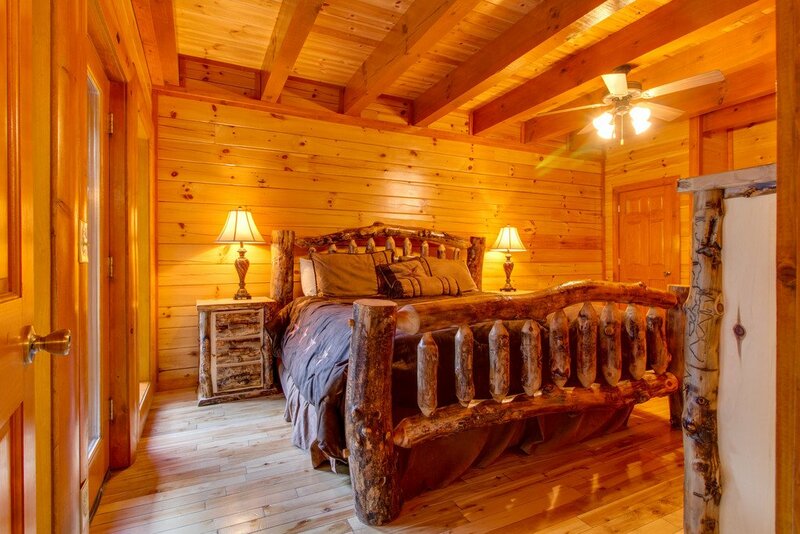 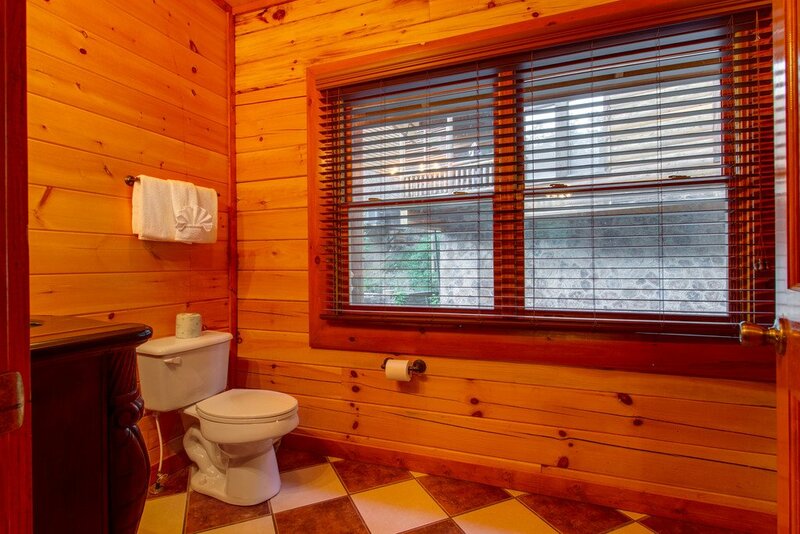 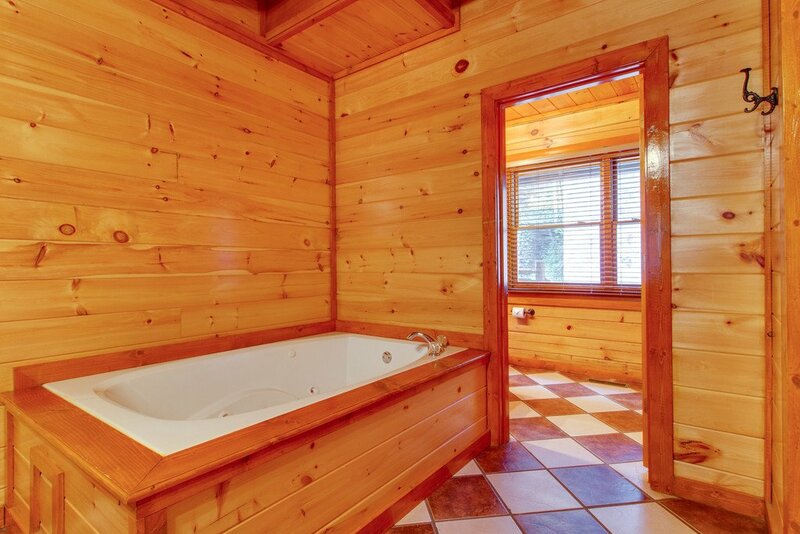 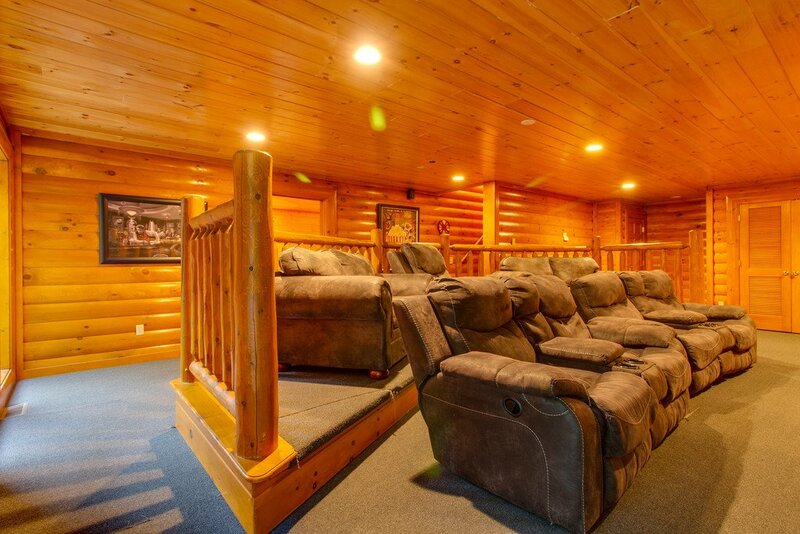 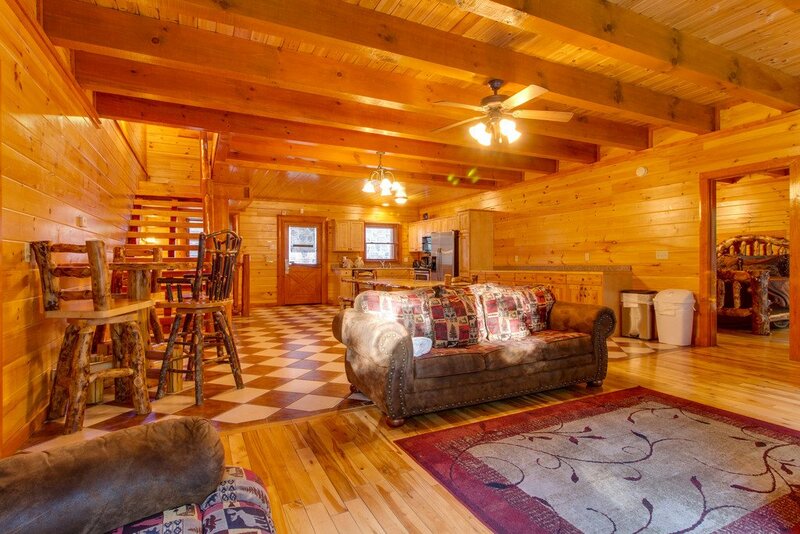 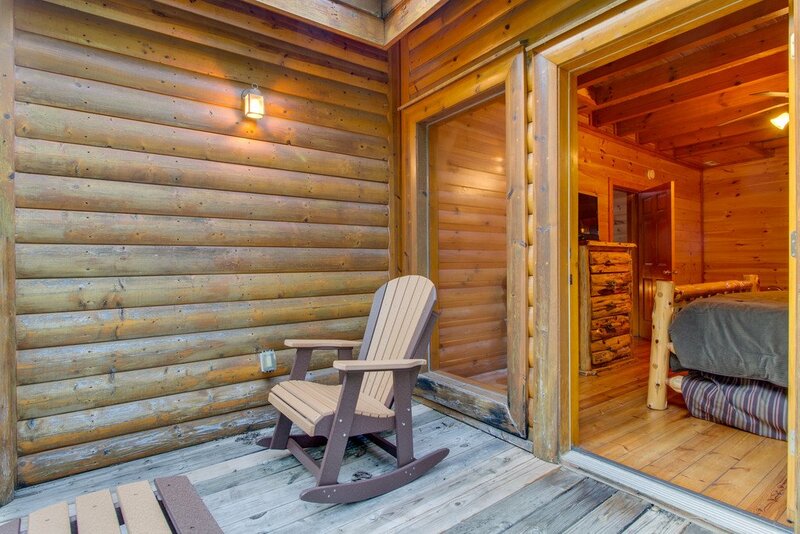 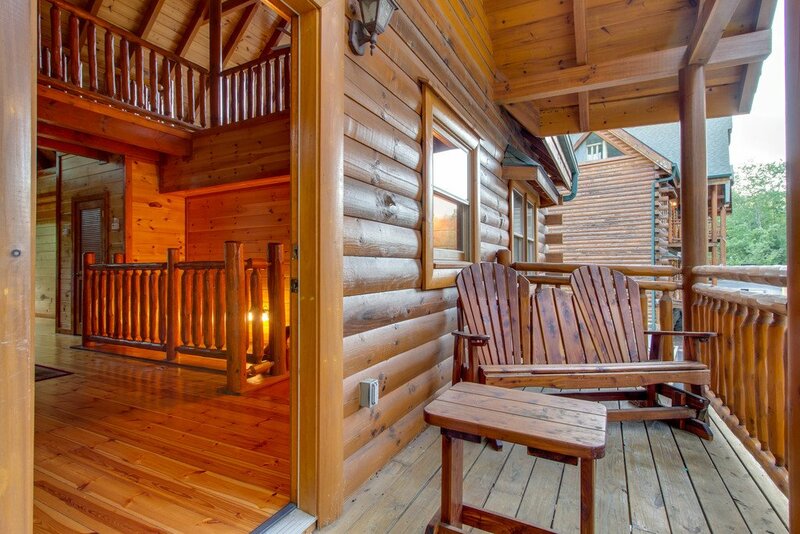 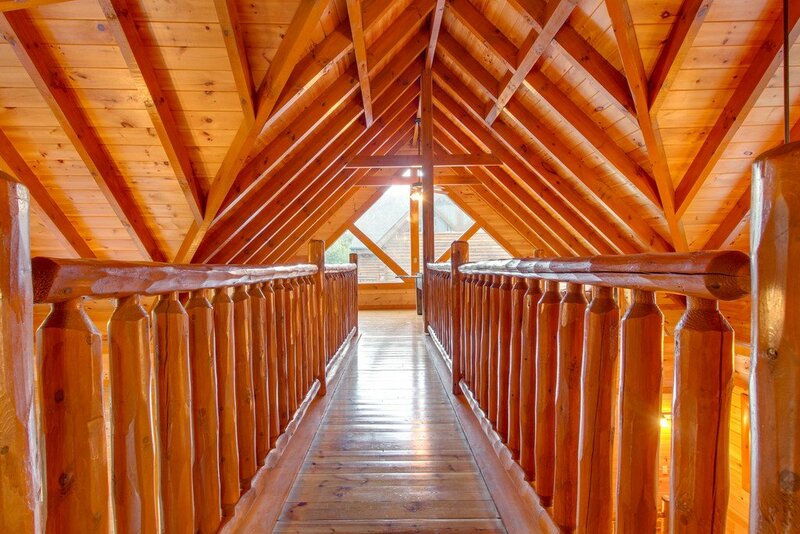 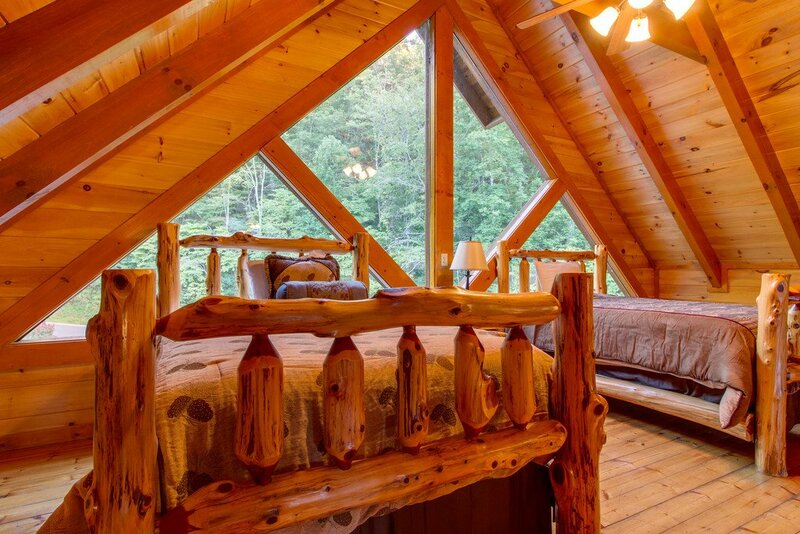 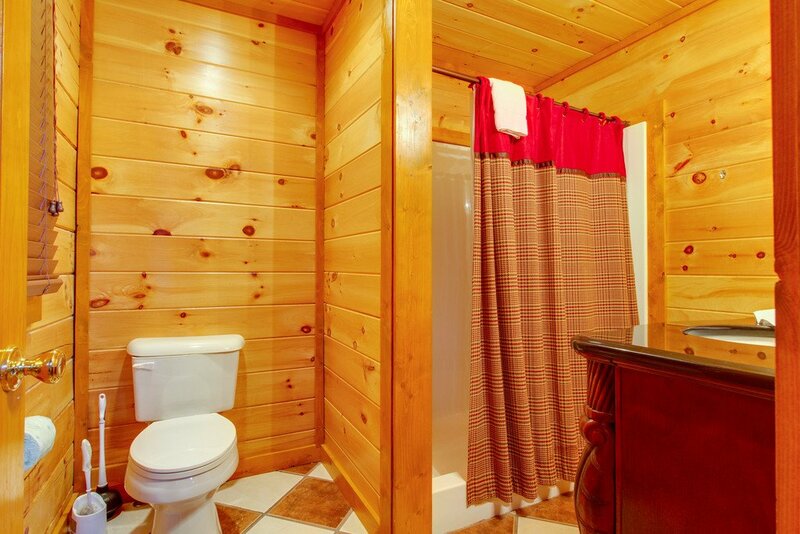 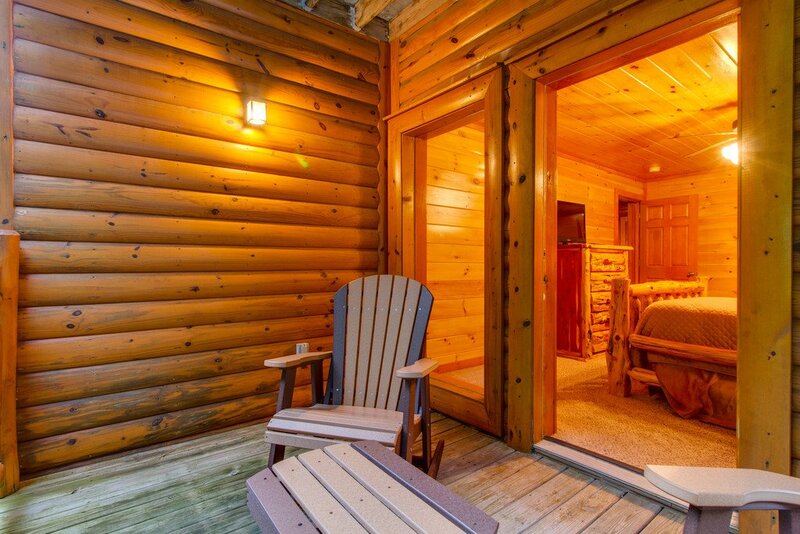 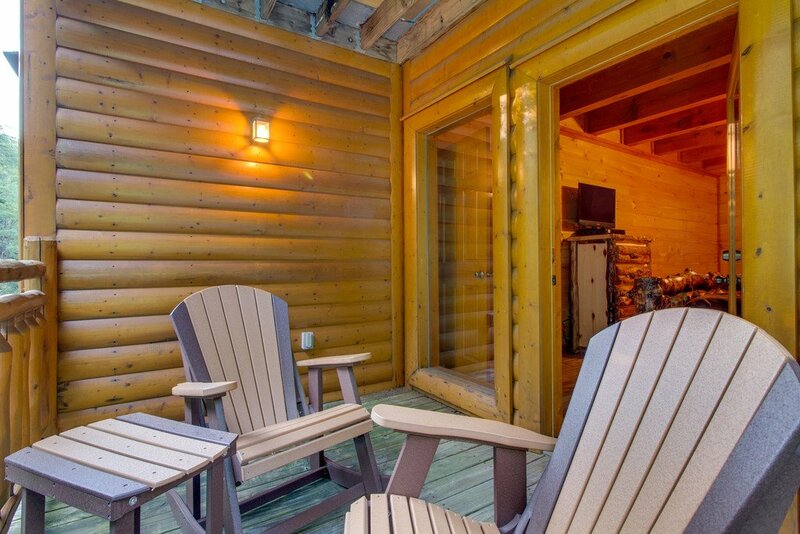 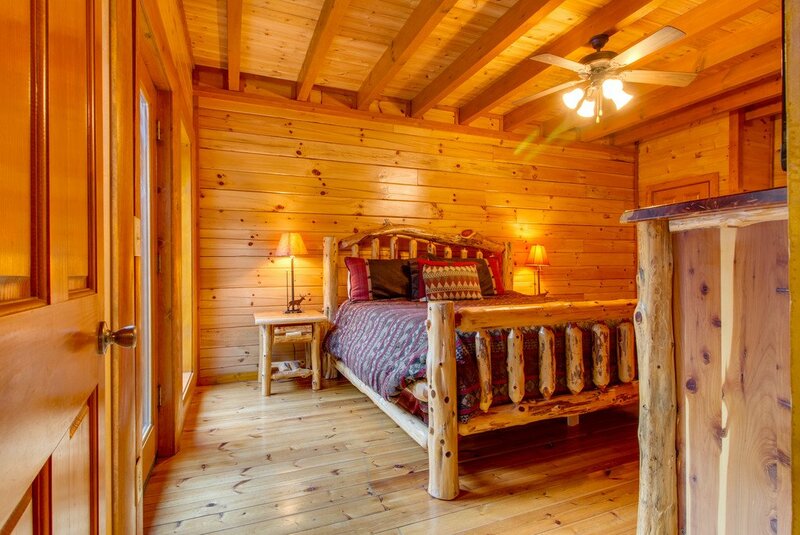 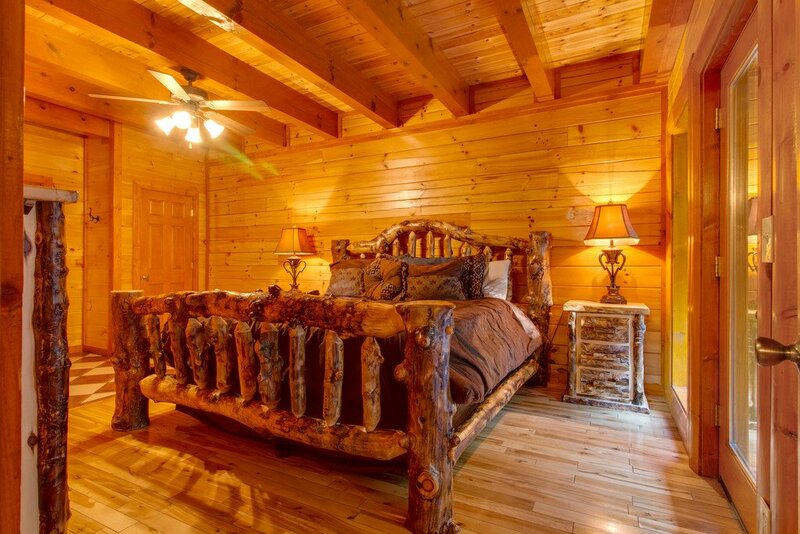 This spacious 6-bedroom, 6-bathroom cabin is the pinnacle of vacation getaways with room to sleep up to 14 people. 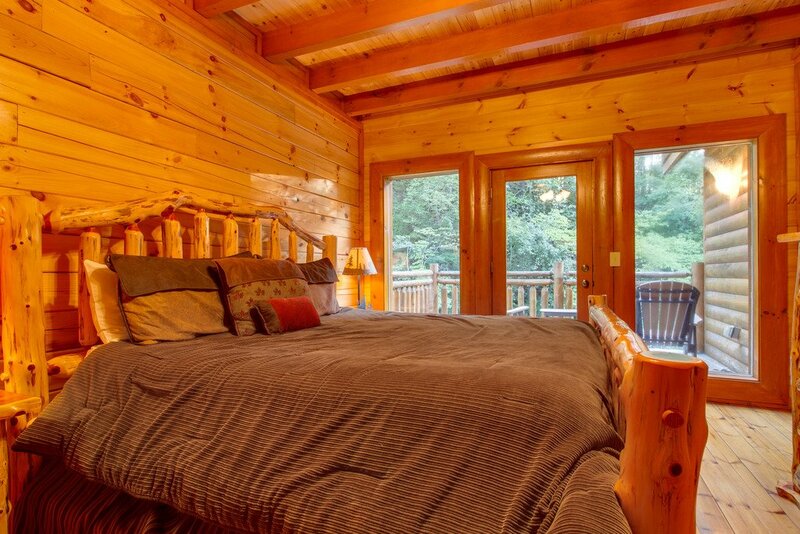 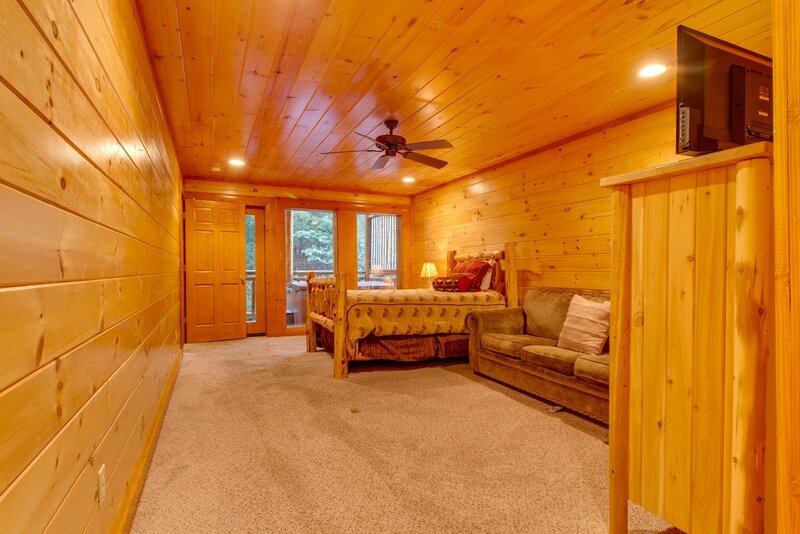 With 4 king-sized beds, 2 queen-sized sofa bed s, a queen-sized futon, 2 full-sized beds and two Queen beds, this cabin fits a large family or group with ease. 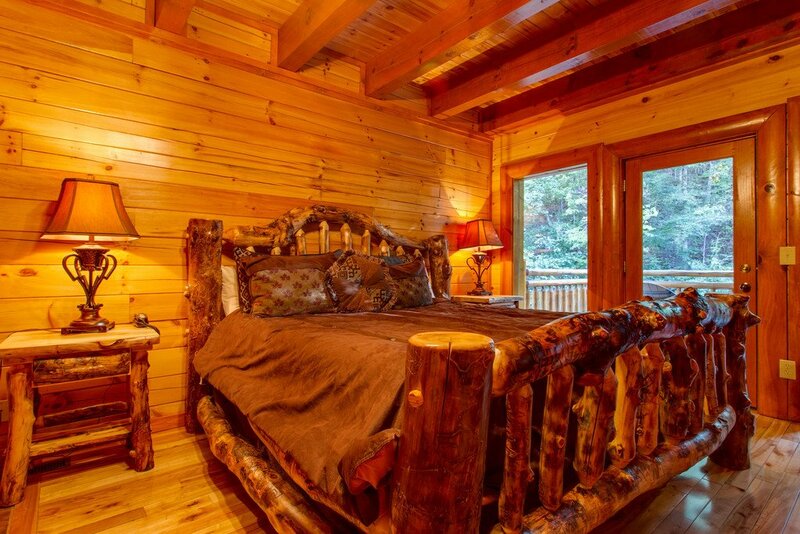 Relax in the lap of luxury with leather and hand crafted log furnishings throughout. 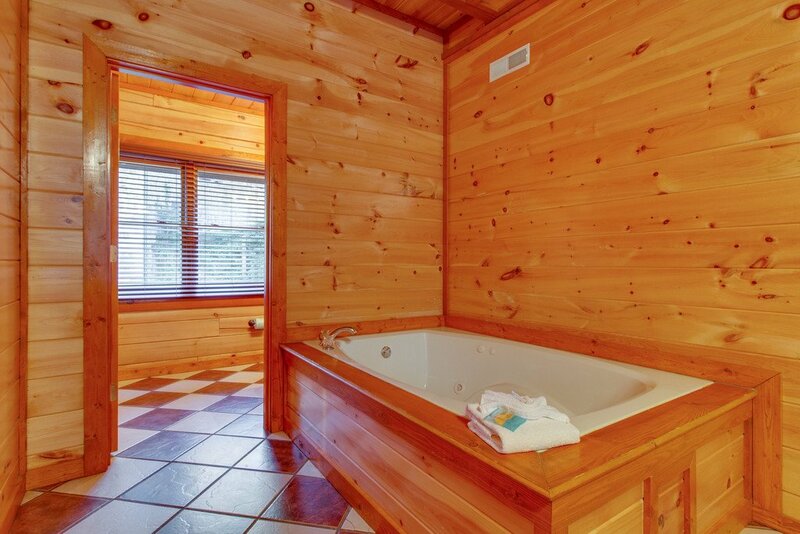 The master suites feature private deck access and jetted tubs to massage away your knots. 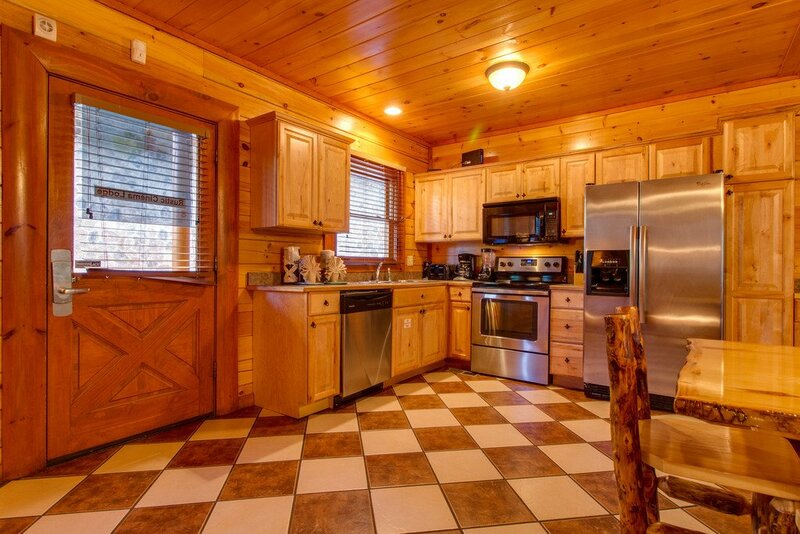 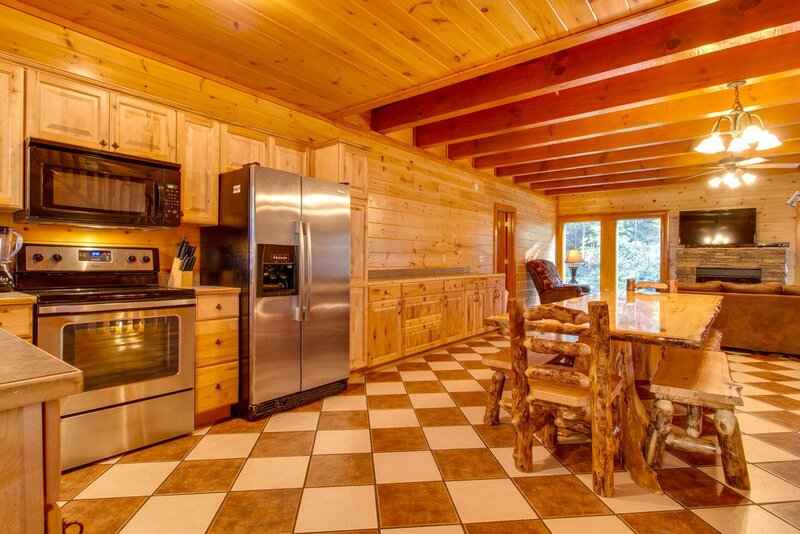 Rustic Cinema Lodge features a fully-equipped kitchen for easy meal preparation with modern stainless steel appliances. 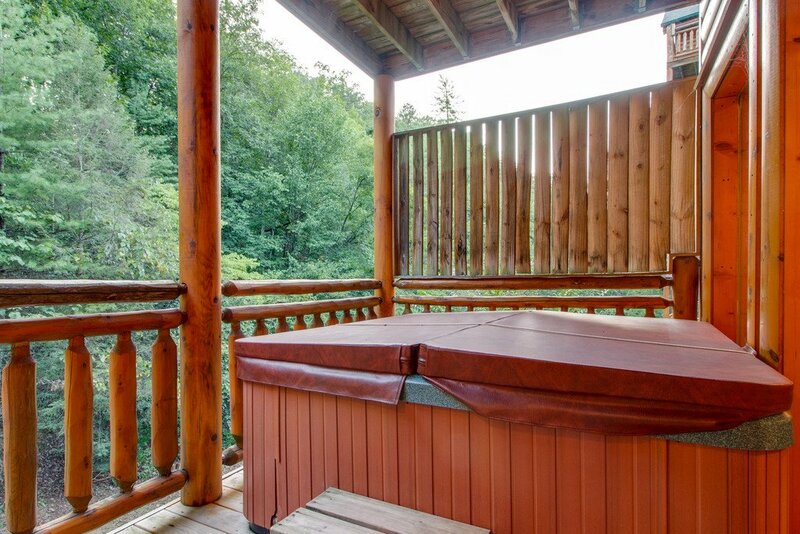 After a long day out adventuring relax in the private hot tub overlooking lush Wears Valley. 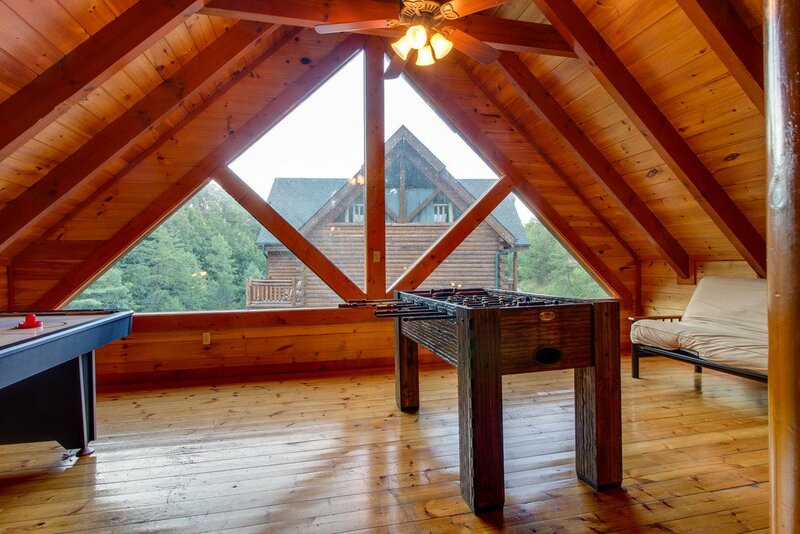 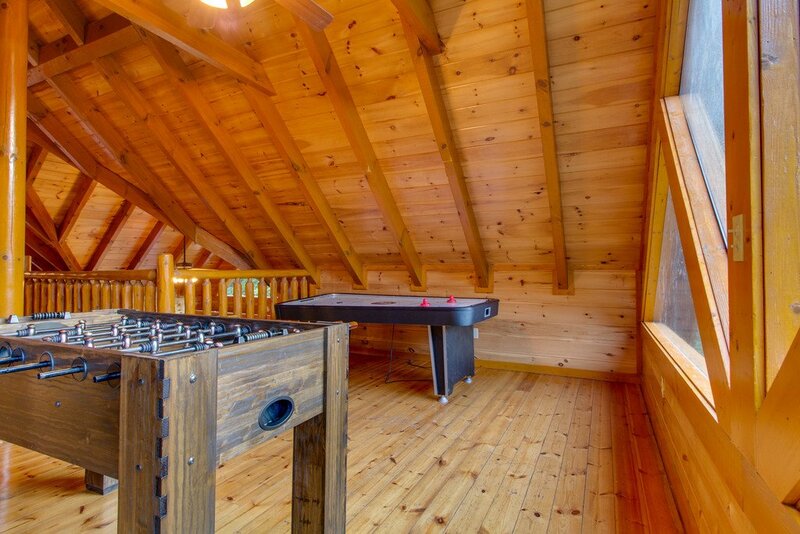 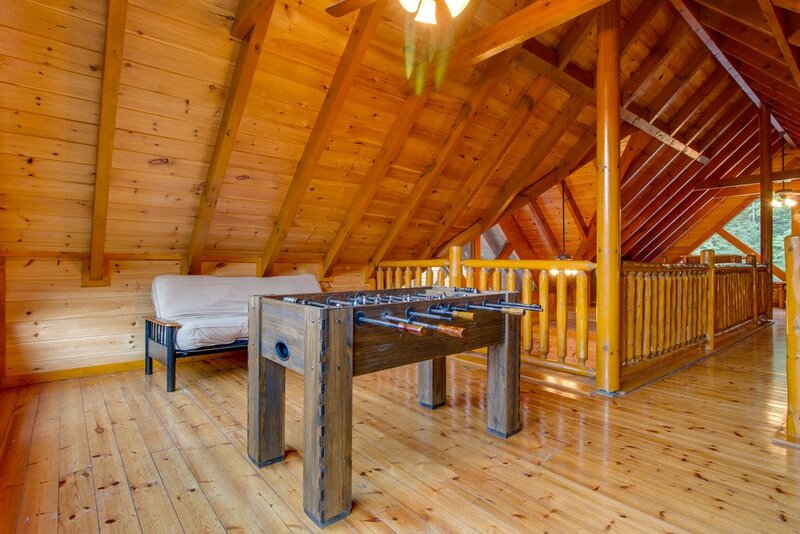 Shoot a friendly game of pool or play the arcade videogame or you can hang out in the loft, stocked with air hockey and basketball. 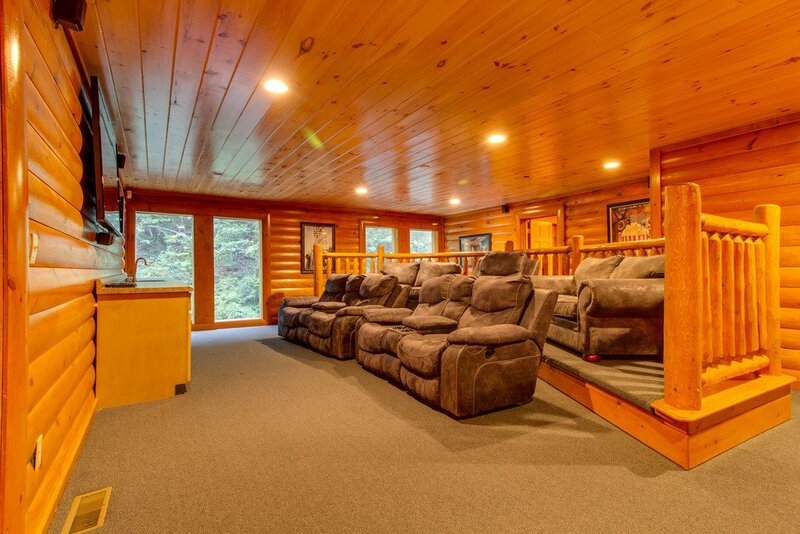 Bring along your favorite blu-rays to enjoy in the theater room featuring a movie screen, surround sound and overstuffed seating, you may not venture back out. 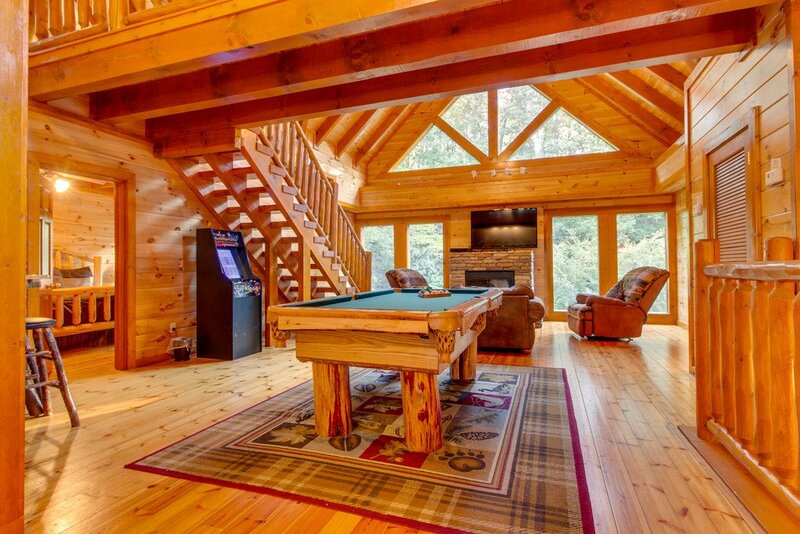 Other amenities include a charcoal grill, 9 TVs, and a washer & dryer combo. 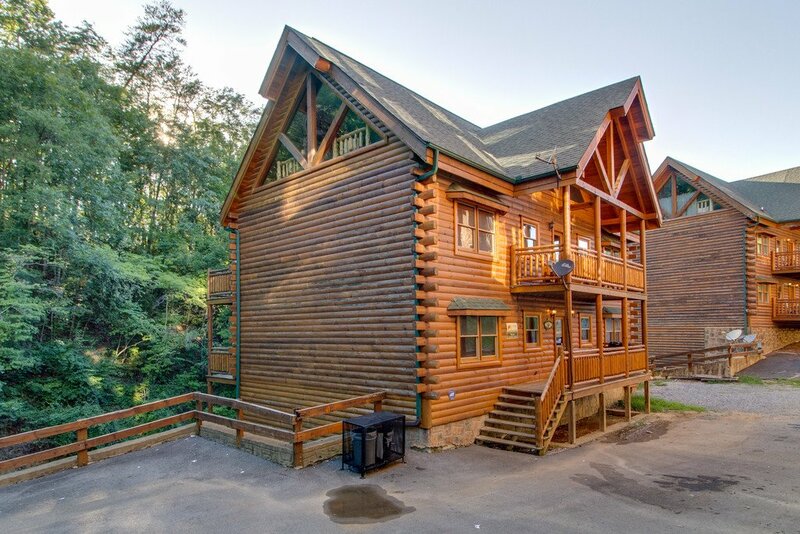 Nestled in the mountainside resort, Black Bear Ridge, you’ll feel miles away from the hubbub yet within minutes to reach all the areas attractions. 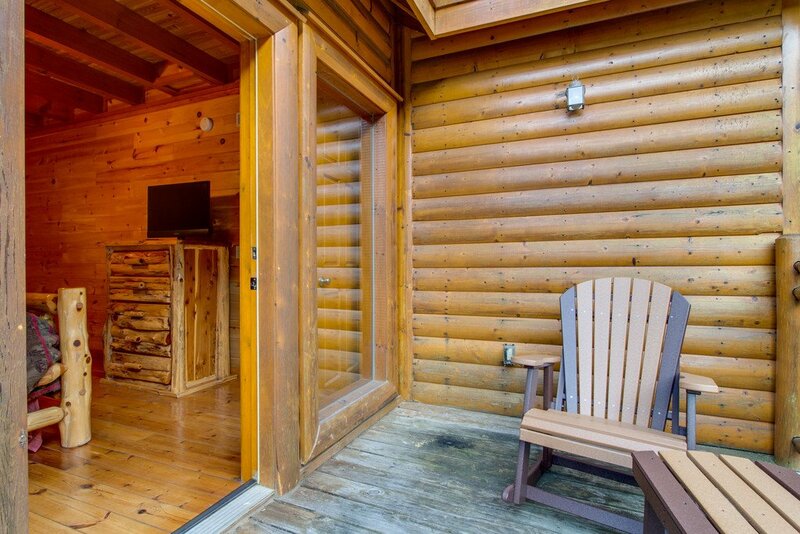 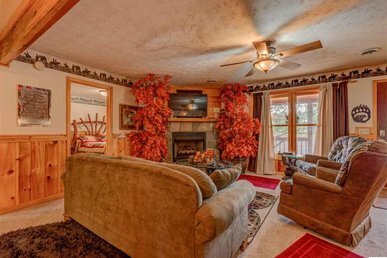 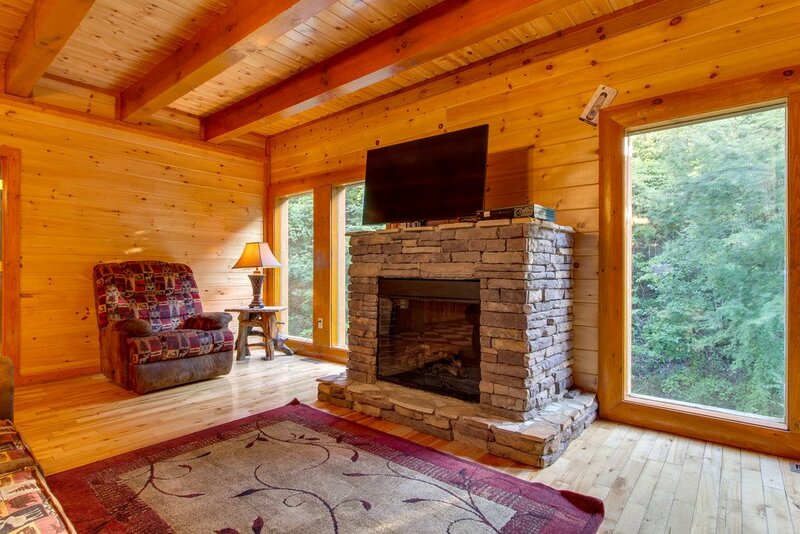 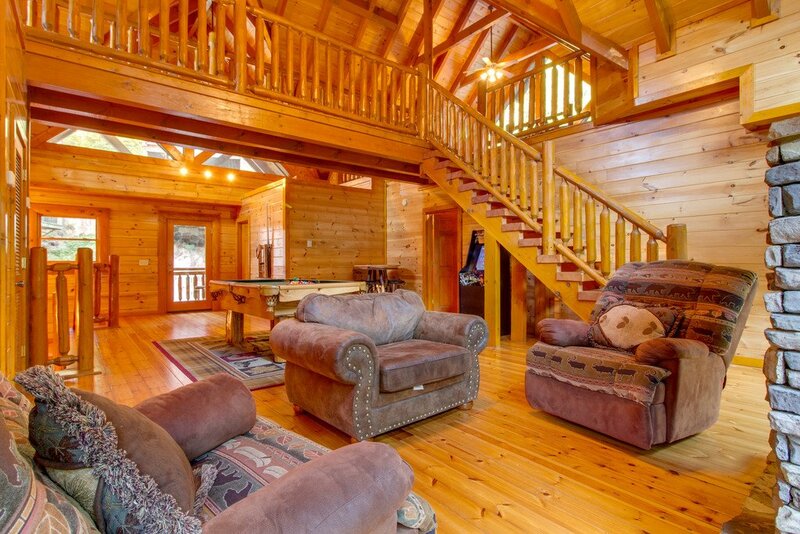 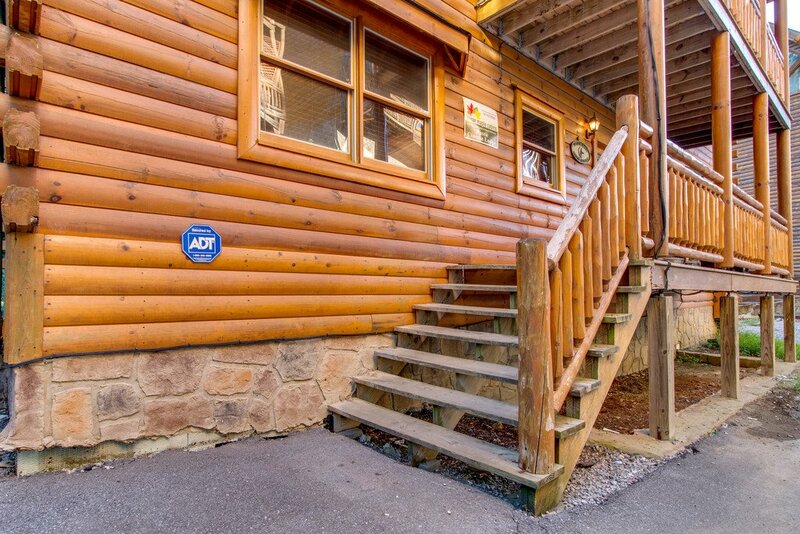 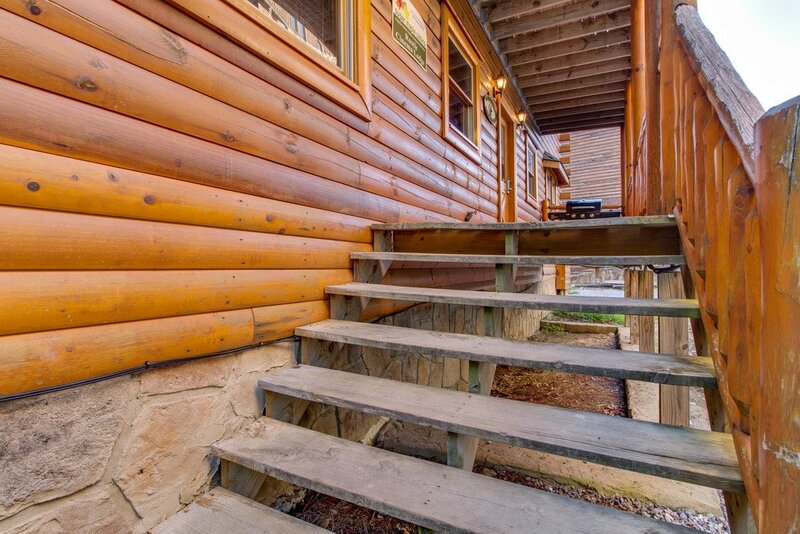 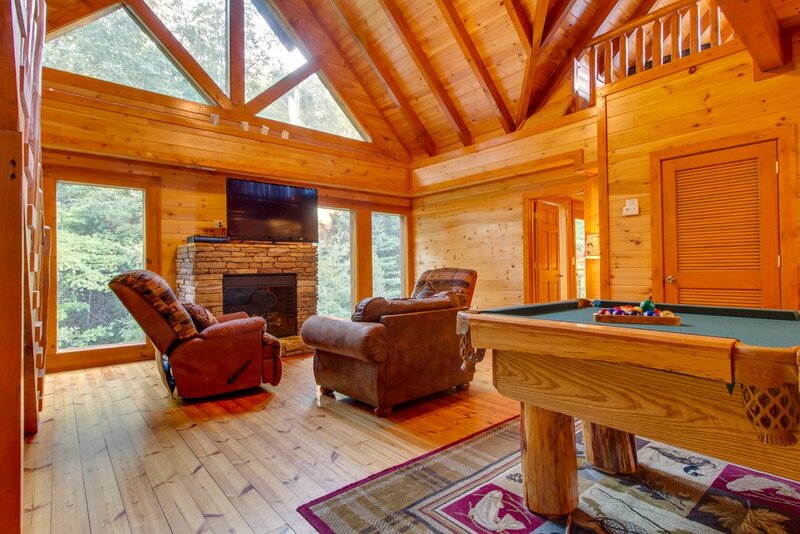 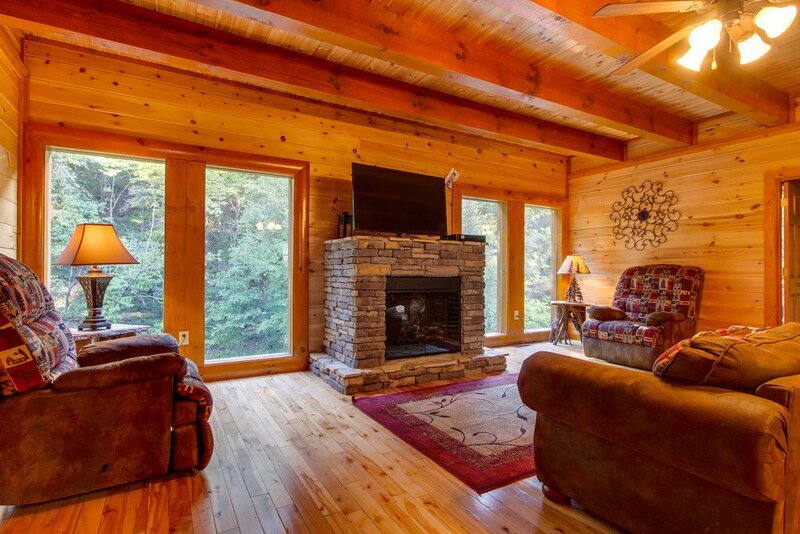 With gorgeous mountain views and a bit of indulgence, along with an incredible location that is within 10 minutes of great shopping and dining, makes Rustic Cinema Lodge a prime vacation rental. 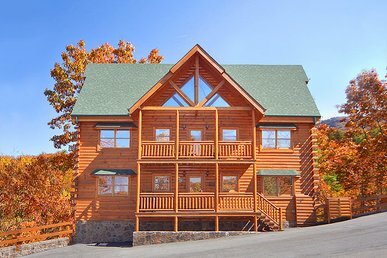 Just a short drive from the doorstep of Rustic Cinema Lodge along the road to Pigeon Forge make a detour to visit The Coaster at Goats on a Roof for a exciting ride on the mountain coaster and a comical way to feed the goats. 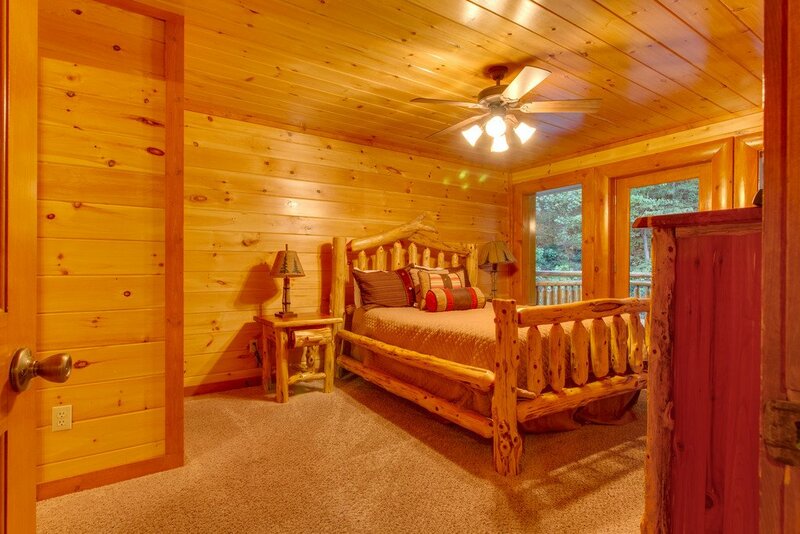 Keep the thrills rolling at Dollywood, full of heart pounding rides and wholesome entertainment. 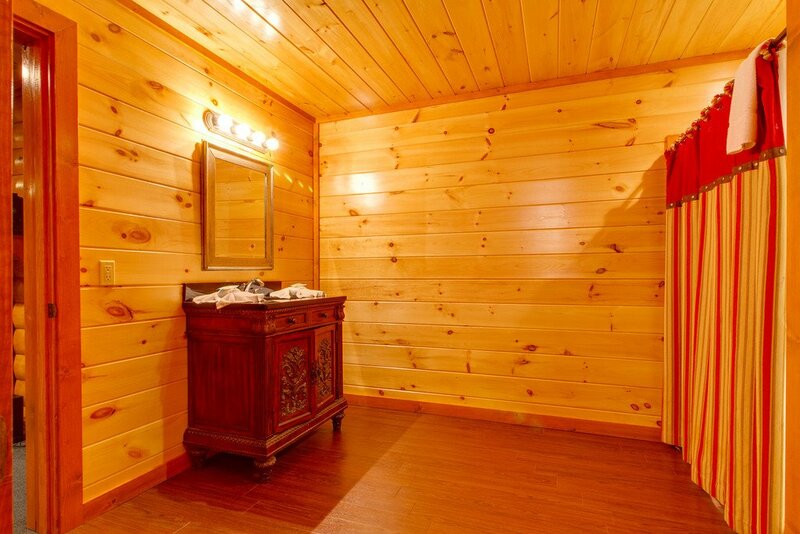 Make sure to save time to shop at Tanger Outlets Center at Five Oaks with over 100 brand names to choose from. 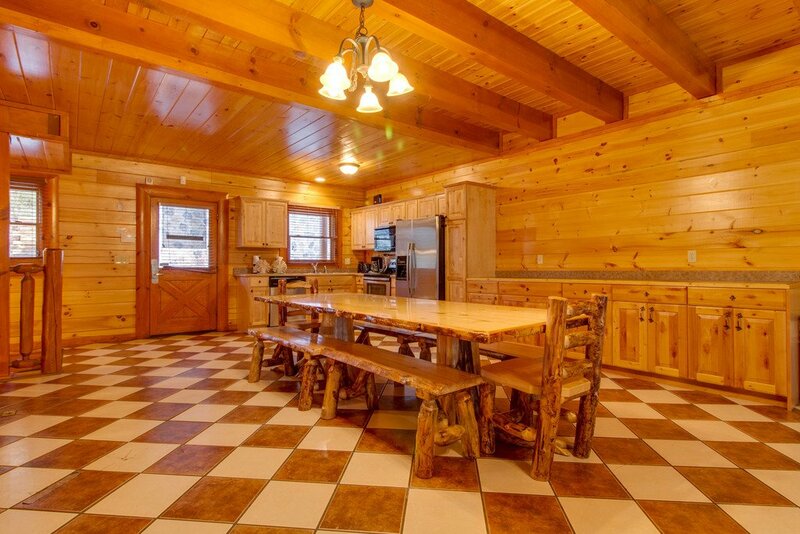 While visiting the area don’t miss out on the renowned dinner shows! 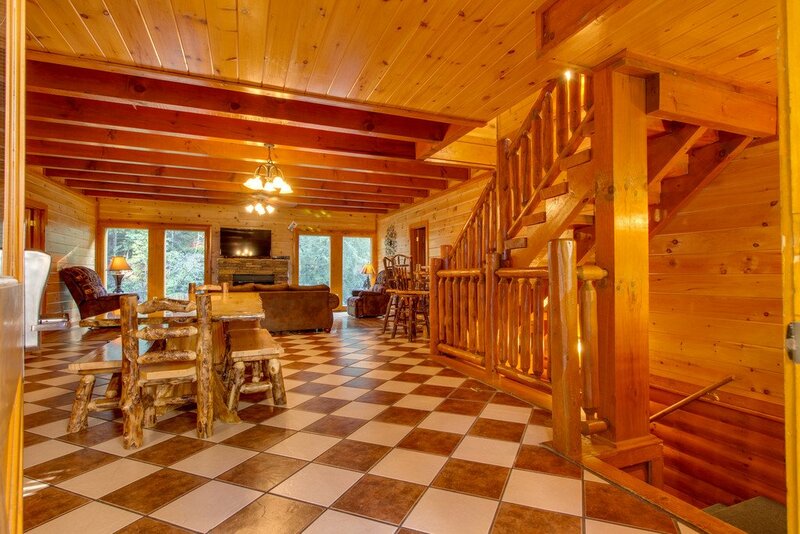 Drop in at the Hazzard County Hoedown to join the gang for an evening of singing, dancing and feasting. 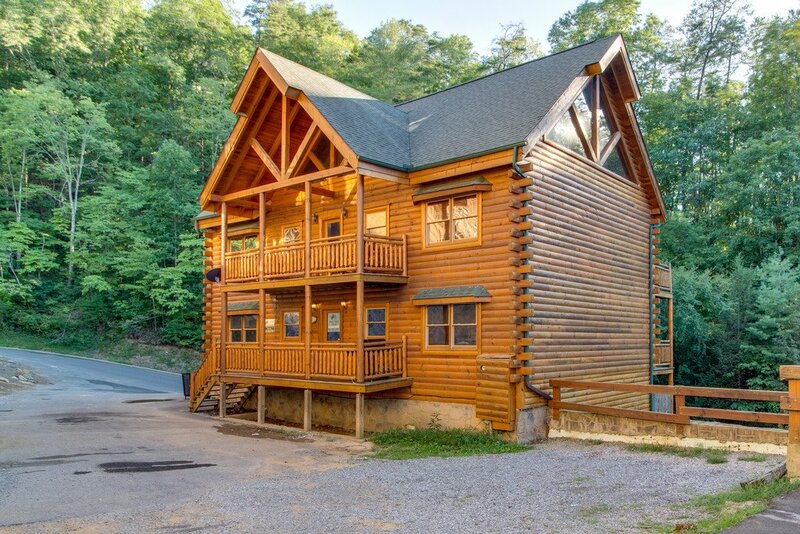 Journey along the Parkway to the quaint town of Gatlinburg, nestled in the foothills of the Smoky Mountains where you can tour the Great Smoky Arts and Crafts Community, the largest assembly of independent artists offering one of a kind crafts. 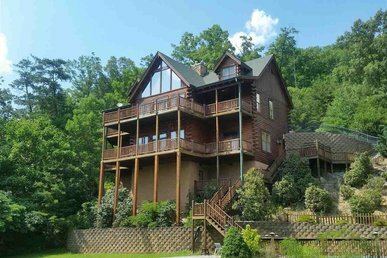 Along the Parkway try not to get lost at Ripley’s Amazing Mirror Maze; stop in at Ripley’s Believe It or Not Odditorium, you won’t find a stranger place in Gatlinburg. 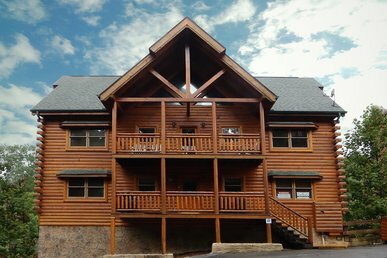 Try a sample of the authentic moonshine and tour the still with a stop at Ole Smoky Moonshine Distillery. 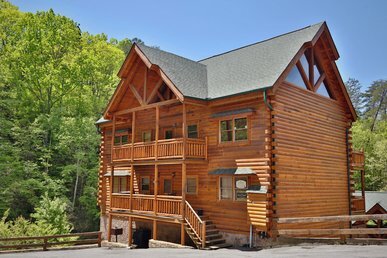 Begin your adventure into the great outdoors challenging the Pigeon River with Smoky Mountain Outdoors for electrifying thrills white water rafting. 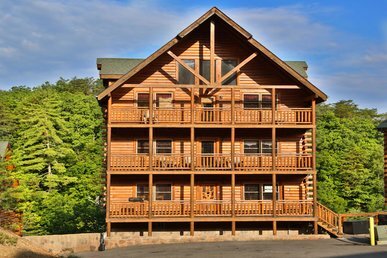 Then take to the tree-tops to zip line with Adventure Park Ziplines, they also offer a tree-top ropes course for another daring adventure. 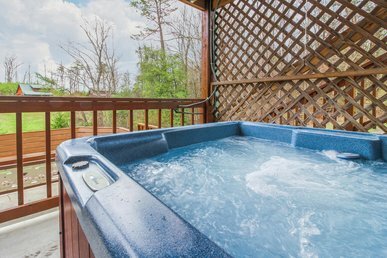 Relax with a horseback ride along the wilderness with Five Oaks Horseback Riding with rides for all ages and skill levels.